President Donald Trump appeared increasingly under threat from the Russia collusion probe Wednesday after a court filing revealed that his former national security advisor Michael Flynn cooperated extensively in multiple high-level investigations over the past year. A sentencing recommendation late Tuesday from Russia probe head Robert Mueller that Flynn spend no time in jail explained that the retired three-star general had given "substantial assistance" to his and other secret, high-level investigations. 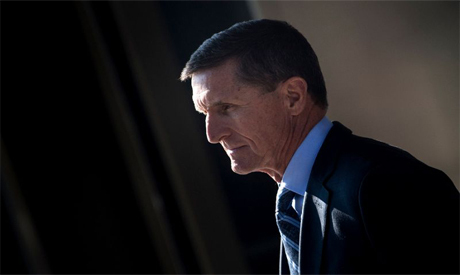 Underscoring the level of cooperation, the filing in the federal court in Washington spelled out that Flynn had been interviewed a total of 19 times over the past year -- during which his sentencing for one charge of lying to investigators had been postponed four times. "Given the defendant's substantial assistance and other considerations set forth below, a sentence at the low end of the guideline range -- including a sentence that does not impose a term of incarceration -- is appropriate and warranted," Mueller said in a memorandum to the court. That came on the heels of Trump's ex-personal lawyer Michael Cohen admitting in a court filing last week that he had been in contact with a top aide to Russia President Vladimir Putin well into the 2016 presidential campaign over obtaining a green light to develop a 100 story Trump Tower in Moscow. Cohen made clear that, contrary to the president's previous denials, he had informed Trump and members of his family about the project throughout the first half of 2016, even after Trump had secured the Republican presidential nomination. Taken together, the two cases added to the evidence that Mueller is building a case that there was frequent and possibly systematic communications between Trump's inner circle and Moscow ahead of the November 2016 presidential election that could bolster charges of perjury or even conspiracy to collude with the Russians. After having condemned Cohen as a liar and saying he deserved a "full and complete" jail sentence, Trump was notably silent early Wednesday about the implications of what Flynn may have told investigators. Flynn was a top-level insider in the 2016 campaign, accompanying Trump to key events and making a keynote speech at the July Republican convention, where he led the audience in a rousing cheer to "lock up" Trump's election rival Hillary Clinton. He then took hold of national security policy in the White House in Trump's first weeks in office, making him a potentially extremely valuable witness. The sentencing memorandum from Mueller, however, gave no hint of what the former head of the Defense Intelligence Agency has said. It said he cooperated on questions regarding Mueller's examination of actions by senior officials of Trump's transition team between the election and the January 20, 2017 inauguration. That could point to Vice President Mike Pence, Trump son-in-law Jared Kushner, or Trump's former deputy chief of staff Rick Dearborn. That was the period in which Flynn repeatedly had secret phone discussions with Russian ambassador Sergei Kislyak that he later lied about, which led to his early expulsion from the White House and then to charges he lied to Mueller's investigators. But in a heavily redacted addendum to Tuesday's memorandum, Mueller indicated that Flynn was helping on two other investigations, at least one not in his hands, that appeared to have deep national security implications. That could be an ominous signal for Trump, Adam Schiff, the senior Democrat on the House Intelligence Committee, suggested. "That most of the details are redacted signals he has given far more than we or the President may know," Schiff said in a tweet. However sketchy, the revelations led to new calls in Congress for a law to protect the 18-month-old Mueller investigation. Trump recently installed an acting attorney general, Matthew Whitaker, who has strongly criticized Mueller for supposedly overreaching in his investigation. "We need to protect the Mueller investigation now more than ever. There's a bipartisan bill waiting to do this in the Senate. We need our Republican colleagues to join us and pass it," Democratic Senator Amy Klobuchar wrote Wednesday on Twitter.